If you keep up on what's happening in the world of food, you're sure to love this list of funny predictions by the "Insatiable" Gael Greene, who served as New York Magazine's food critic for over 30 years, is known for wearing really big hats, and famously slept with Elvis and Clint Eastwood (not at the same time) as well as a cadre of celebrity chefs. She also co-founded Citymeals-On-Wheels, a service that delivers meals to the homebound elderly. I discovered the list -- which is on the Insatiable Critic website -- while catching on up on my post-holiday reading. "Restaurants will staff roving dining “tutors” to stop by each table with a five minute “Tabletalk” on the provenance of each ingredient on the menu. Before ordering, you will be quizzed on the content." "Conceptual Dining will become the rage. The pleasure derived from the dish is found in its description alone. The dish, in fact, does not exist. A small fee will be charged." [I think this one might be my favorite]. "Boutique chocolate will be labeled with the production date and the chocolatier’s license and cell phone numbers. Chocolate tastings will be widely promoted, as well as the usual What to Drink with Chocolate selected by chocoholics." I was really happy to discover this list, in part because it made me laugh, but also because I recently wrote my own list of predictions for 2008. I suppose it's validating to learn that you've independently thought of doing something that a person at the tip-top of your profession has also thought of. Unless you're Missy Chase Lapine and your profession is sneaking spinach into kiddie food. Here are my Vermont-y versions...I forwarded the current one to Ms. Greene this afternoon. Maurice Sendak is probably best known for Where the Wild Things Are. But as a youngster, I had a much deeper affection for a miniature set of Sendak books called "The Nutshell Library." 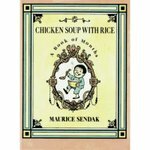 Of the four tiny books, my favorites were Pierre: A Cautionary Tale in Five Chapters and a Prologue and the yummy Chicken Soup with Rice: A Book of Months. When I learned today that January is "National Soup Month," the silly, sing-songy jingle of CSWR was the first thing that popped into my head. Down the chicken soup-y Nile. Just for the record, Seven Days does NOT advocate pouring chicken soup on flowers or drinking from the Nile. Wanna see the whole poem? Thanks to Carole King, who turned the story into a song, you can find it here. Email your creations to [email protected] Entries must be received by December 12. The cream of the crop will be printed on December 19. I ate a Hachiya persimmon the other day and it made me think of this poem. The first time I ever tried one, I didn't know how to tell whether or not it was ripe, and the fruit had the most astringent, mouth-drying effect I've ever experienced. Now I know to wait until the fruit feels like pudding inside of its bright orange skin, which, by the time it is ripe, may be dotted with black. Lee's poem is full of memories. One of them is of an American teacher who served an unripe persimmon to her class. Due to copyright laws, I must excerpt poems and link to sites that have the full text. When I was a very young yet voracious reader, my favorite passages in books were always the dinner scenes. Give me a crackling fire and a holiday feast to luxuriate in and I'm happy as the proverbial clam. As I got older, I began to "collect" food poetry, too. The literary potential of fruits, vegetables, meats, even casseroles is nearly endless. Love that's like a rose is so old-fashioned...how about love that's like a bowl of stew or a pile of dandelion greens? Anyway, here's a bit of a food-focused poem written by Charles Simic, who was named Poet Laureate earlier this year. I first read it in a modern poetry course at UMass. He also wrote a poem featuring cabbage, but I haven't been able to locate it on the web. I love the title! In his daily work, Carl Winter, PhD. deals with some pretty serious stuff: toxicology, food borne illnesses, and more. He has testified before Congress about pesticide safety and written papers with titles such as "Characterization of epoxide hydrolase activity in Alternaria alternata f. sp. lycopersici. Possible involvement in toxin production-Epoxide hydrolase in alternaria alternata f. sp. lycopersici." Huh? But from the looks of it, Winter has a fun side, too. UC Davis, where Winter works, hosts a webpage filled with his parodies about food safety. These have titles like "Don't Get Sicky Wit It" [to the tune of Will Smith's "Gettin' Jiggy With It"] and "Clonin' DNA" [to the tune of the Beach Boys "Surfin' U.S.A."]. Although he uses to much jargon in a few of them, some are pretty funny. And it's kind of neat that he plumbs a variety of genres. Are you worried that it's modified? It’s fun to work with the U.S.D.A. Did I have poisons on my plate? Some dude who is not Weird Al has collected the lyrics to all of his songs (that's where I found the above), including a bunch of unreleased ones. Who knows how he got his hands on them. Here are some titles of ones we might see in the future: Avocado (Desperado, The Eagles), Chicken Pot Pie (Live and Let Die, Guns 'n' Roses), Don't You Forget About Meat (I better not have to tell you) and Gravy on You (Crazy on You, Heart). Here's a little contest for you...this is the chorus of an unreleased Weird Al parody of a famous song. Can you guess the song? If you're really lucky, I may share some of my own gastro-parodies in the future...how about you?